A Franchise that suffered through nearly a quarter century of incompetence, that once had its office doors padlocked by the Internal Revenue Service and that in 1984 placed its last hope for survival in the hands of an 18-year-old named Mario Lemieux saw its entire sorry history smoothed over with Zamboni-like precision last Saturday night. Led by Lemieux, the Pittsburgh Penguins won the Stanley Cup by routing the Minnesota North Stars 8-0 in Game 6 of the final series. Afterward, Lemieux was awarded the Conn Smythe Trophy as the MVP of the playoffs. Then, as proud as any captain who ever held the Cup aloft—and, at 6'4", taller than most of them—he hoisted it as high as it has ever been hoisted. 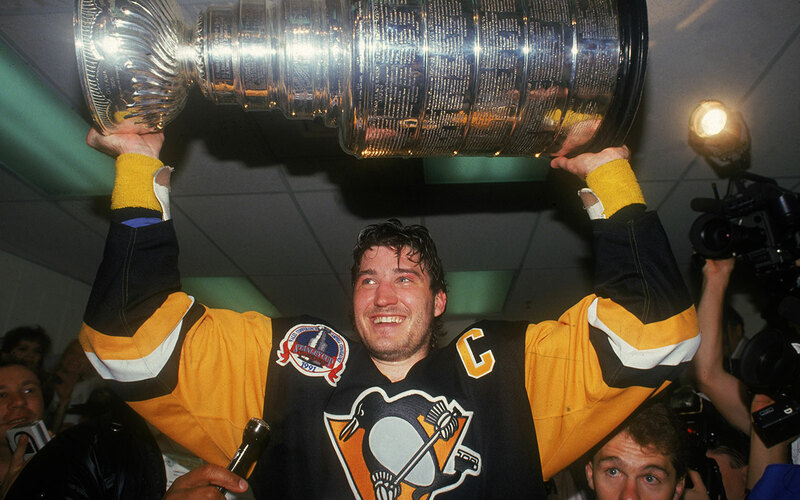 Certainly few players have ever been required to lift a franchise the way Lemieux was asked to lift the Penguins, who until this season had not advanced beyond the second round in postseason play. "There wasn't going to be hockey in Pittsburgh anymore if not for Mario," said goalie Tom Barrasso. "And we wouldn't have won the Cup without him." Lemieux had five goals and seven assists in the championship series, despite sitting out Game 3 with back spasms. He wound up with at least one point in each of his last 18 playoff games, and he scored at least one goal in each of his last 10. In Game 2 of the series against Minnesota, he had a breathtaking one-on-one goal that reversed the momentum of the game, which the Penguins went on to win 4-1 to tie the series. In Game 5, he scored a goal and set up two more in a four-goal first-period blitz that gave Pittsburgh a 6-4 victory and control of the series. Finally, with the Penguins leading 1-0 in Game 6, Lemieux deflected a pass during a 5-on-3 Minnesota power play, then forced the Stars' Mike Modano to take him down. The resulting penalty eased the crisis to a mere 5-on-4. Moments later, Lemieux broke away and made three separate backhand-to-forehand moves en route to scoring a shorthanded goal that made it 2-0. He would add three assists. At practically every pivotal moment against Minnesota, as well as in the Penguins' six-game triumph over the Boston Bruins in the Wales Conference finals, Lemieux responded with either a point or a strong shift. In the finals, he also played strong defense, continually bumped North Stars off the puck in the Pittsburgh zone and patrolled center ice like a minesweeper. "It seemed like anything that was within 20 feet he reached," said Minnesota's Dave Gagner. "When somebody that big and that good wants to win that badly, there isn't much you can do." "We were hoping that Mario would be just regular," said North Star coach Bob Gainey, "but he wasn't." Instead, Lemieux was driven and dominant, exactly what his critics had insisted he would never be. Lemieux has been trying to live up to extraordinary expectations since the Penguins made him the No. 1 selection in the 1984 draft. Lemieux, who is among the few players who possess a fifth gear, was generally content to play in fourth gear his first few seasons. Sure, he got his points—he scored 141 in 1985-86—but Pittsburgh was slow to assemble talent around him and didn't make the playoffs his first four seasons. Denied the experience of playing in big games, Lemieux had no understanding of the level he would have to reach to win them. That changed in the 1987 Canada Cup, when Lemieux, challenged by world-class opposition and pushed by Team Canada linemate Wayne Gretzky, played with as much heart as talent, scored a tournament-high 11 goals and led Canada to victory. "He was a different person when he came back from that," says Pittsburgh forward Phil Bourque. Lemieux out-scored Gretzky in each of the next two seasons and performed well in his first playoff appearance, as the Penguins reached the seventh game of the divisional finals in 1989. Yet Lemieux's emergence as the game's premier talent while Gretzky was still near his peak offended large portions of the hockey world. It seemed impossible that such a gifted player could come along and challenge Gretzky's accomplishments so soon. Denial was a common reaction: There was no room for another player of Gretzky's caliber until the Great One's career had started to wind down. In addition, Lemieux, a reluctant and tepid interview, has suffered in off-the-ice comparisons to the outgoing Gretzky and to the St. Louis Blues' effervescent Brett Hull, who has emerged over the past two seasons as the NHL's top goal scorer. Moreover, Gretzky won four Stanley Cups while with the Edmonton Oilers and brought the moribund Los Angeles Kings to life. These team achievements cemented his place as the greatest player of all time. Lemieux, on the other hand, had to deal with the trumped-up charge that he wasn't a winner. The evidence may have been circumstantial, but Lemieux had no way of disproving it with the woeful Penguins. "I don't care what people write and say about me," said Lemieux last Saturday night, "as long as I have the respect of my teammates." The criticism "has to have hurt him a little," said defenseman Paul Coffey, one of Lemieux's closest friends on the Penguins, "but I know it would hurt him more if he had thought his teammates believed any of that stuff. He was going to hear it until he won a Stanley Cup. It was unfair, but that's just the way it goes." It went that way even in Game 1 of the finals, in which Lemieux scored a short-handed goal but nonetheless faced raised eyebrows after the North Stars recovered to win 5-4. Not enough? Then how about that marvelous goal in Game 2 at Pittsburgh's Civic Arena. The North Stars had scored early in the second period to cut a 2-0 Penguin lead in half when Lemieux commenced his improbable journey up-ice. Taking an outlet pass from Bourque, Lemieux roared in on defenseman Shawn Chambers, faked outside, cut inside, used his backhand to put the puck between Chambers's legs and then raced ahead to pick it up on his forehand. Minnesota goalie Jon Casey wisely waited for Lemieux to make the first move, but that didn't help. Lemieux took the puck to his forehand, switched it to his backhand and, while sliding to his knees, put the puck into an empty net. The sleight-of-hand required to complete the play at the speed Lemieux was traveling was astounding. The spectacle was also deflating for the North Stars, who had all but shut down Hull and other potent scorers in the first three rounds. Two nights later at the Met Center, the same Lemieux who had left North Stars tumbling all over the ice as if their skate laces had been tied together, couldn't unfasten his own. Lemieux, who reported to the rink with stiffness in his back, tested it during warmups and decided he couldn't play. The spasms—which the Penguins insist are not related to the back surgery Lemieux underwent in July 1990 or to the subsequent infection that forced him to miss the first 50 games of this season—usually subside within a few hours if Lemieux doesn't try to play through them. Hoping to get Lemieux back for Game 4, the Penguins didn't push him to take the ice, and the result was predictable: Minnesota won 3-1 to take a 2-1 series lead. The next day, Penguin coach Bob Johnson and general manager Craig Patrick refused to bring Lemieux—or any other player, for that matter—to a scheduled media session at the Met Center. However, a Pittsburgh reporter who had had difficulty catching up with Lemieux as Lemieux walked briskly uphill on a sidewalk near the Penguins' St. Paul hotel, reported that a Game 4 comeback by Le Magnifique was looking strong. Most doubts about his ability to continue in the series were removed when he whisked in a goalmouth setup by Mark Recchi to climax a three-goal burst that gave Pittsburgh a 3-0 lead after only 2:58 of the first period. With Lemieux dishing out more than his share of bumps and getting to many of the loose pucks, Pittsburgh, which would prevail 5-3, survived a Minnesota rally and a five-minute penalty late in the third period before Bourque put the game away with an empty-net goal. It was apparent in the first two shifts of Game 5 in Pittsburgh that Lemieux understood that the series was now his to win. In the first period, he went on a feeding frenzy. After Penguin defenseman Larry Murphy shot the puck wide of Casey, Lemieux grabbed the carom off the boards and went backhand-to-forehand to sweep the puck across the goal line before Casey could get to the post. With the score 2-0, Lemieux skated past Chambers and Gagner to create a 2-on-1 at the Minnesota blue line and then led Recchi perfectly with a' backhand pass. Recchi converted with a bull's-eye over Casey's left shoulder. Later, Recchi made the score 4-0 by hitting the top of the net again, this time off a rebound created by Lemieux jamming at the cage. But as in the previous game, Pittsburgh squandered most of its lead and needed a late goal, this time from Troy Loney, to escape with a victory. Though the North Stars performed pluckily enough to make all but Games 2 and 6 an adventure, the series wasn't always well played. Both teams took unnecessary penalties at key moments. Minnesota suffered several flat—and dooming—first periods, and the Penguins, while improved defensively, played fast and loose at times. Though Pittsburgh was as tight as it had to be when protecting a lead late in games and almost perfect throughout Game 6, its Cup triumph was hardly forged in the traditional manner—with defense. The Penguins won because they generated brilliant offensive bursts that the North Stars could not. Before hopping on board Lemieux's aching back for the exhilarating ride to the finish, Pittsburgh was nearly eliminated in the first round by the New Jersey Devils. The Penguins faced do-or-die situations in Games 6 and 7 of that series without Barrasso, who had injured his right shoulder in Game 5, but they survived with backup Frank Pietrangelo in the net. Pittsburgh trailed the Bruins two games to none but rallied despite the series-long absence of Coffey, the best offensive defenseman in NHL history, who was sidelined with a broken jaw. With Lemieux having missed so many regular-season games, the Penguins had been conditioned to playing—and winning—without their best player. They also had been toughened by the late-season acquisitions of center Ron Francis and defenseman Ulf Samuelsson. Recchi and Kevin Stevens gave Lemieux the scoring support he had lacked in his early years in Pittsburgh. The defense, with Coffey mostly a power-play specialist in the finals because of his injured jaw, was an unlikely concoction of discards, but it somehow got the job done. And Barrasso, after returning from his injury midway through the Patrick Division finals against the Washington Capitals, was superb. So a lot of Penguins helped create the occasion, but it was Lemieux who rose to it. The long arms of the best player—in the series and on the planet—carried the Stanley Cup to Pittsburgh. PHOTOPAULBERESWILLLemieux took apart the North Stars with five goals and seven assists. PHOTODAVID E. KLUTHOBarrasso shone in Game 6, even when he was lying down on the job. PHOTOPAUL BERESWILLWith checks like this one on Mark Tinordi, Lemieux showed that he is more than a scorer. PHOTOBRUCEBENNETTLast Saturday night, for the first time known to man, Penguins were spotted flying high.